Talend Open Studio is an excellent ETL tool that can be used beyond the typical database and CSV manipulation. XML processing for example is today all over the places in the Enterprise. 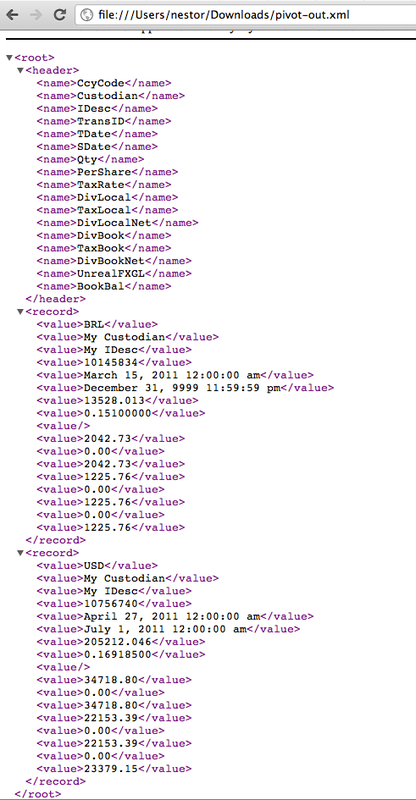 As a consequence XML transformations are a key skill for those folks doing data transformations. Even though there are more efficient tools XSLT is a standard which is supported in Talend through the tXSLT component. You just need to provide your XML, XSL and output files and Talend will apply the transformation for you. Talend uses Saxon at the moment so you get the benefit of clear error messages when trying to build your XSL. Of course XSLT might be a skill that even scares some people, however XSLT is not difficult at all and the more you work with it the better you get as with any other human skill. Do not try to avoid it, if you have XML to process and your ETL tool is Talend then do your homework and learn some XSL. As there is no better way to teach than providing an example I decided to write this quick showcase that will pivot the data resulting from running an Advent Geneva RSL report (A SOAP service) which comes in the form of key value pairs into a tabular output. I will provide two responses: XML and HTML. The first is probably what you need in Talend while the second is probably what you need if you want to provide a quick add hoc HTML report page. If you open it with Firefox and you choose "View XPath" from a right click on the body of the page (contextual menu) you could try several XPATH expresions. Together with XSLT skill it comes XPATH which is just a way to address a node, an attribute or textual content in the XML. 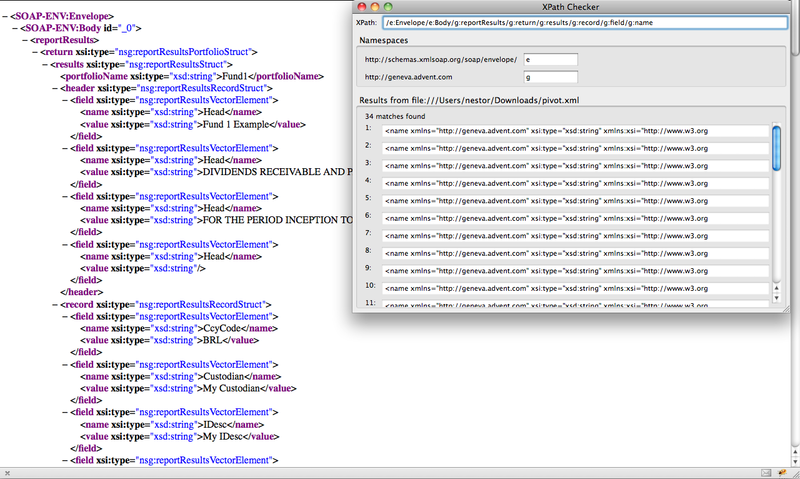 See below how I tested one of the XPATH using this tool. Pay attention to the namespace definition, I use simple letters to abbreviate more verbose prefixes. 1-6 Is just stating it is an XML document which uses a namespace prefixed "xsl" for the transaformation instructions, a soap namespace with prefix "e" and an Advent Geneva namespace with prefix "g". Note that I abreviated the original namespace suffixes for the last two. 7-9 How the final output should look like. 11-19 We use the Muenchian grouping that allows us to have a list of all possible column names. 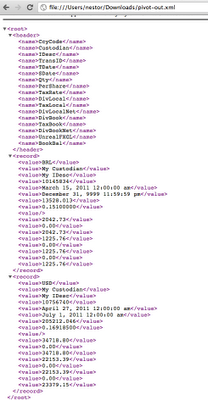 21-37 XSLT is a functional language which works matching nodes and applying transformations to them. The logic can be affected using xsl:apply-template. We use xsl:element to create our custom nodes: First the headers which come out of the Muenchian key and later the records for which we again use the keys while addressing the correct record through an xsl:foreach nested loop. 39-41 The template responsible for generating the name nodes. I blog about the work that I do just because "the palest ink is better than the best memory"
I tweet about most of the stuff that I do or I am interested in just because I think for some people is just easier to get an SMS alike message with a title that makes you decide if the article might be of your interest. I consume most of the information I am able to digest via RSS. These three statements probably make me not a good social network user. I would love to have time to follow 2000 people, interact with them, engage in interesting conversations and so on but I don't believe that is possible for a first generation immigrant, father of three kids and with the hope to remain competitive in the fast paced World of IT. The way I live and work push me for automation even when consuming information. RSS, Atom or whatever format for syndicated news is then the answer to my needs. Syndicated feeds should be a mandatory option for any website or service providing information. If you are like me you will love this trick which allows you to silently consolidate in your News reader (I use Google Reader BTW) tweets from people you would like to follow. I make my statements public because I do care about what others think. If you consume them via RSS, email, native program or any other means that is secondary for me. No, I have no quick fix for this because SQL Server is not about magic and there is a reason why there are guys that work 100% of the time as SQL developers. You have to ensure your queries are optimized and you know what query plan will be used when they are run. This is not about Java or .NET problems because your SQL Server Management Studio (SSMS) is "apparently" running the query 10 or 20 times faster than the application. It is indeed about your SQL code optimizations. One of our servers was reporting low HDD resources and as usual I took a look at log files. Yes, again /var/log/mail. * were above 1GB, in some cases even 5GB. And the SMTP server was not configured to relay to such a thing like myhost.myhost. So just changing it to an authorized domain should fix it right? Well I kept getting the same error!!! Aug 23 22:26:47 myhost nullmailer: Delivery complete, 42489 message(s) remain. There is one time when your JVM hosting your servlets will demand connecting to more than one SSL Web Service, an LDAPS, passing in some cases private keys, using in some cases different keystore files and more. In those cases the typical System properties to set up the keystore and password will apparently not work. You can of course pass the properties as part of the java command line that starts the JVM but you can do the same programatically of course. You will be tempted to get into a really complicated solution. However there is a simple approach around this problem. If you are contraint about having just one keystore to host multiple certificates that should not be a big issue. After all it is a key "store". All you need to do is import all your certificates and keys in just one keystore following a procedure like the one I described before. Again what you need to have clear is how you deal with your keys which might be encrypted with a password and that password must be the same you use for your keystore. At that point if you have let us say just one case for a key using a password you can just use the same for your keystore. If not then negotiate a new common password with your service providers. This is after all your client key, yes it is private but it is private to you. A simple phone call and an agreement on the new password will make the trick. Do not use an email for that though! We recently spent several days troubleshooting issues like this just because I was relying on "that was already tested and it did not work". It demanded a new developer to take over the task so he could start fresh and try the most basic stuff. Simpler is after all better. The BHUB philosophy is a unique entry point for all the business logic. A Controller makes that happen and there is no question on the big savings. The logic can be used from a CLI script (even pure curl can do the job), it can be of course croned, it can be used from any device (handhelds, desktops, appliances). You get for free every single security you applied in your web tier and I better stop right here because I have written about this several times. The common way to interact with BHUB would be to get a session, security token from an entry point let us say a login service and from there on keep requesting using that information. It would be ideal though that the entry point could be any page. In other words allow the first request to be actually not just login but a service request where you provide login information. Here is the Filter code. 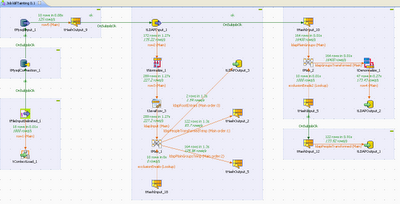 Even though I solved this through the use of a nodeJS script I wanted to get the problem solved from Talend. 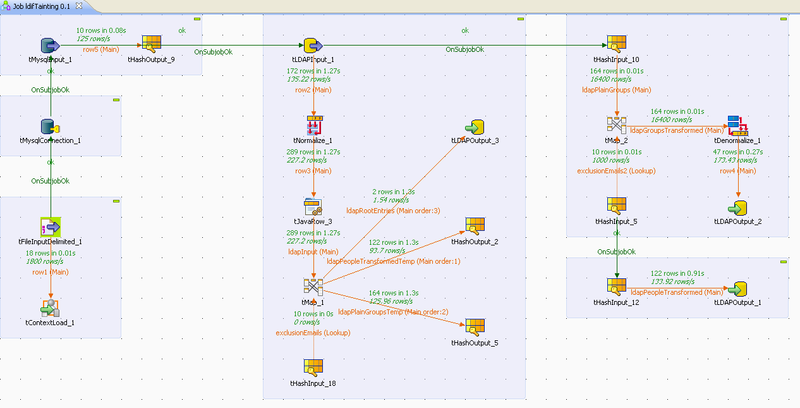 Here I discuss how to do it from Talend. There are still some outstanding issues. 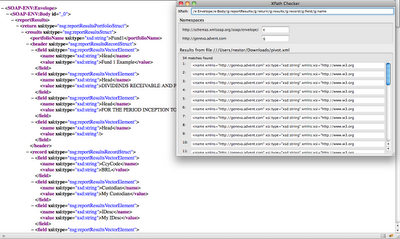 As you can see in the picture I am reusing the list of white listed emails from a hashmap (tHashOutput_9). Only one connection is done to the input LDAP server which needs normalization (tNormalize) for group/uniquemember. A tJavaRow is responsible for adding a column containing just the uniquemember email for filtering purposes executed by tMap_1. tLDAPOutput_3 inserts the root elements while tLDAPOutput_1 and tLDAPOutput_2 insert users and groups respectively. Note that the latest two are in a separate subjob to be able to create the root entries before. Again the use of hashes allow to communicate both subjobs. I got an email in my Gmail account from "Twitter Support" "with subject "Your account has been suspended" with no text content but an image (that I have disabled of course for security reasons). The image content was something like "We detected unusual activity ..."
This phishing email is nothing new but what came to my attention was that Gmail was not able to detect the spam even though the full headers from the message are showing how Google identified it as a candidate for Spam "Authentication-Results: mx.google.com; spf=hardfail (google.com: domain of support@twitter.com does not designate 203.115.131.123 as permitted sender) smtp.mail=support@twitter.com"
Any software is plenty of bugs. Even with the best developers on board you are still vulnerable. Good that "Report phishing" option is available albeit a little bit hidden behind an arrow close to the Reply link. User experience should be helping better here I would say but regardless the important lesson to learn is to be always suspicious up front. Do not trust any bad news (account hacked or compromised) or too good news (You just won a million dollar) you receive.